Hotel Cosmos is cradled in a bowl of high peaks. 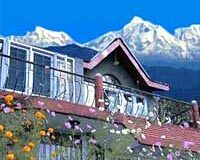 Located on the famous Mall Road, Hotel offers some of the most sensational views of the hills & valleys. Hotel is designed to give the best Vantage point to enjoy the panoramic views from Hotel & the viewpoint opposite to the Hotel. The location of the hotel is its greatest attraction. Location : Airport 23 kms, Bus Terminal and Railway Station- Nearby.